The journey I made in Florida scarcely resembled the itinerary I sketched out before leaving. I’d intended to circle Lake Okeechobee and then head north through the Central portion of the trail. But numerous construction sites along the dike - and the somewhat hostile No Trespassing signs, fences and gates that accompany such activity - deterred me. Often I encountered what I came to call the “Corps of Engineers Special”: A fence right before a bridge that I could have otherwise crossed in order to get on the highway and walk the shoulder. But the improvisation I was forced to do in such situations often made for some good adventures, so I shouldn’t complain. And let’s not forget that the Corps is responsible for creating and maintaining this section of the trail to begin with. 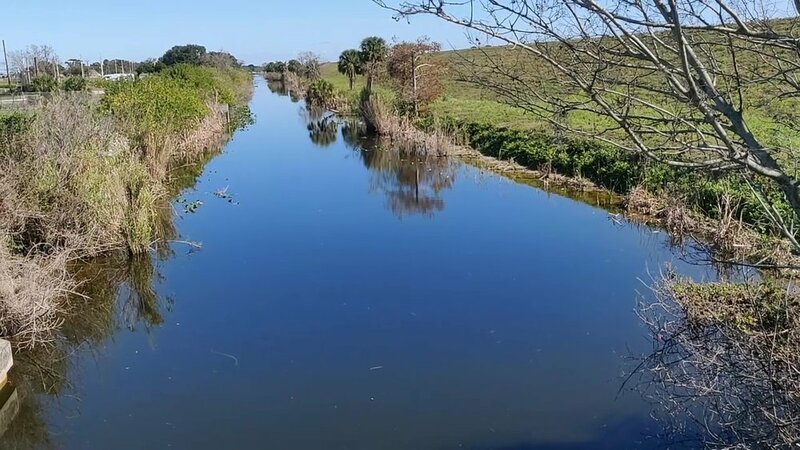 I decided to take the Ocean to Lake Trail because I was near to it anyway and, most importantly, it offered the kind of wildness and diversity that I’d been craving through all those weeks in the much more tame and cultivated Lake Okeechobee area. I found a visitor center and then was able to pick up the trail from there. The change happened at once: Tall pine forest, then onto a dirt road that wound in a tuning fork shape around a mine, farmland all around. This felt like a prelude to the actual trail. It started in earnest as tree cover grew denser and I had to wade through water in places. Probably 90% os the second day’s hike involved sloshing through water. I’d brought crocks along for this purpose, but soone decided to just leave my shoes on and embrace the brutality, as they say. You can’t hike all day in crocks; the rubber plus the wet would blister your feet hideously. And it’s just not feasible to keep changing footwear all day. I filtered water that ranged from green to the hue of dark beer or orange soda. Third day was slightly less water but more mud, the kind you have to constantly fight against because of the suction it creates. I traveled with a group of three other hikers, and we spent the night at the Everglades Youth Camp, where we were able to order pizza and I drank an inordinate amount of cola. The trail offers spectacular views of numerous lakes and marshes. On day 4 I hiked with my clothes ties to my pack to dry in the sun and lost a few items along the way, among them a pair of my favorite shorts that had accompanied my since the beginning of my adventure. Tent and tarp needed to be laid out in the sun, too, because of heavy condensation during the night. We resupplied at a plaza about twenty miles from trail’s end and then finished up with some brief road walking and then a stretch of sand dunes. Day 6 found us in Hobe Sound with a view of the ocean. I began this part of my ongoing saga in Okeechobee, Florida. Getting there from Albuquerque required a 72-hour train ride spanning Tuesday to Friday. I switched trains in Chicago and then again in Washington. The trailhead initially looks like a beach park and the first few miles are paved like a sidewalk. It runs straight as an arrow, riding the dike built by the Army Corps of Engineers that faithfully follows the canal. The benches are a welcome respite. My plan at this point was to circle Lake Okeechobee and then head north into the Central Florida section of the trail. Allergies plagued me for a few days, maybe due to the shift from the arid desert clime of the Southwest to high humidity. I saw my first alligators on day 2: One placidly sunning by the canal and another (which I hadn’t noticed) plunging into the water when I approached to fill my water bottles. You have to get used to the proximity of civilization and resulting lack of privacy on this stretch of the trail. Traffic was often seen - and almost always heard - off to my right, and to my left motorboats frequently powered up and down the edges of the lake. Also, after hiking for nearly two months without issue I got blisters within just a couple days, probably because of the humidity and the monotony of the trail, your feet hitting the hard road in the same way time and again. This forced me to stay in a motel room (in Lakeport) earlier than I’d originally planned. Within a week or so my feet toughened up and I no longer had any problems. 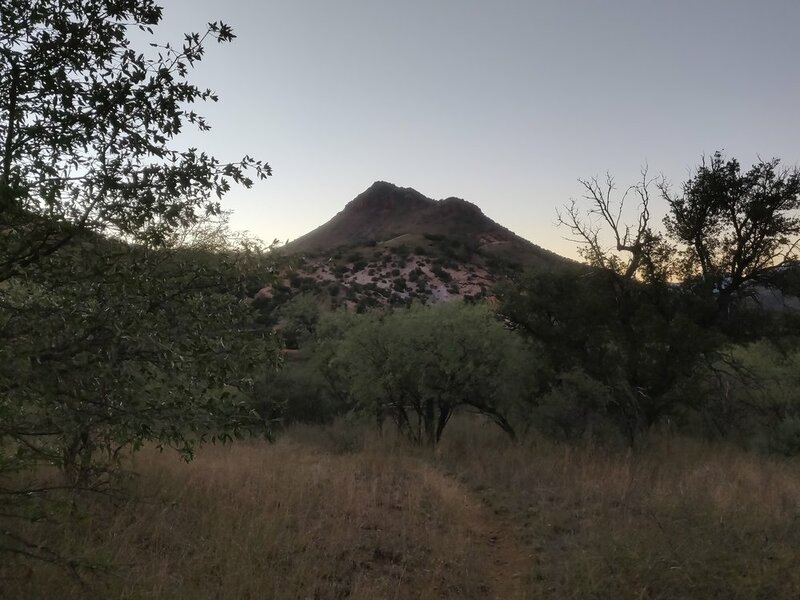 The following night I enjoyed some of nature’s Providence: an orange tree with a dozen ripe fruits was secreted among taller trees right behind where I’d pitched my tent. Then I was forced off the trail by construction - the first of several times that this would occur - and had to walk for several miles on the shoulder of the highway. A family stopped and offered me a ride the rest of the way into Moorehaven. The trip to Oracle from Patagonia involved a bus ride, a stay in Tucson, two cab rides and a hitch from the suburb of Orovalley. Finally I found myself at the trailhead, about 10 a.m. on a Thursday morning, third week of November. Thus began my most rigorous climbing on the trail thus far. I was also facing water scarcity: The first place to procure it is at the High Jinks Ranch (a tourist stop where one can see, among other things, a Hollywood relic of a horse carriage where Elizabeth Taylor once sat in a movie) and the second is in the mountaintop town of Summerhaven - from a restaurant or restroom - some 13 miles later. The trail south of Oracle began fairly mellow, but once it began climbing it rarely stopped. One particular stretch, much of it a steep double-track of loose stone, demanded five hours struggle (with frequent breaks) for me to make eight miles. Still waiting on those trail legs! I was concerned about the one liter of water I had carrying me the whole way (the temperature was cool - in the fifties - but the sun was shining). The struggle with the climb cost me so much time that the sun was setting while I was still eating in town. There’s no lodging in Summerhaven, so I was obliged to head back out to the trail and backtrack in the dark - a path cutting alongside a mountain, steep rise to my right and drop to my left - to find a campsite. Amidst all those climbs and drops, patches of tall grass and rock, by sweet serendipity I landed on an ideal spot within half an hour aided only by a headlamp. One of my greatest accomplishments as a hiker to date! I ate at the Sawmill Run again the next morning and spent some time chatting with the gentleman working at the Mount Lemmon Community Center. I considered that the best strategy for getting back to the High Jinks Ranch (the closest water resupply) would be to really “camel-up”, in hiker-speak, in town. The road back was no easier (though maybe less physically taxing) downhill than it’d been uphill on account of the treacherous rock. You have to be braced every step of the way down. This led to my second night of searching for a campsite in the dark; this time it took longer because I drifted a mile or so off trail before I realized my mistake. I got picked up at the trailhead by a trail angel and brought back to her very hiker-friendly lodgings, The Chalet Inn. This trip began with a couple of false starts. The most time-consuming one involved an alternate route (ostensibly due to road work) that turned out to be unnecessary. I’d been overly-dependent on GPS-app navigation and had trouble following the written directions for the alternate because I was still getting hip to the lingo (“Turn left out of the wash and follow the double-track towards the ridgeline”). When I finally reached the trailhead I met a lady - a trail angel, as they say - who visits various places along the Arizona Trail to leave jugs of water for hikers. After a couple weeks of solo hiking with only brief breaks in a town where I didn’t know anyone, “my senses were sharp for any human contact,” as Kerouac wrote in “On the Road”. Temperatures began dipping below freezing overnight (it was now mid-November) and so I started sleeping with my water filter and phone inside my sleeping bag. I also built fires most nights, something I’d never done in New Mexico on the CDT. I’d come from Vermont, where the varieties of trees are vastly different for the most part, and yet ironically foraging was much the same: Dark wood that’s more stubborn and smoky and the lighter (both in terms of weight and color) wood that burns quicker. Some of landmarks along this stretch included Walker Basin trailhead, Casa Blanca Canyon, Anaconda Creek and Bear Creek. Arizona had experienced an unusually rainy October and surface water - sometimes running over the trail - was plentiful. Sonic boom sounds sometimes reached me from the army outpost on the other side of the mountain, as well as the retort of hunters’ guns, all of these strangely surreal sounds to hear in the wilderness. Another thing distinguishes traveling in Arizona from what I’ve experienced in the East: The roads ride along the crests of the hills. You become conscious of such things when you’re obliged to huff it up all of those rises. 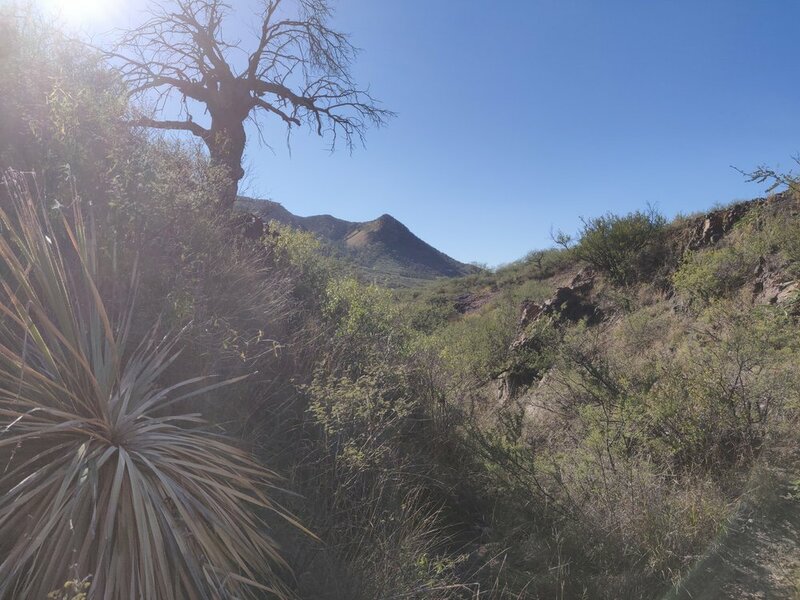 Meanwhile I wrestled with the core conundrum of how to proceed on the Arizona Trail when lodgings were scarce along the way. This may not pose a challenge for someone whose first priority is to thru-hike the trail, but it complicated my own desire to document the journey on video - a task that requires occasional downtime in places where I can recharge my electronics, get online to edit and upload, etc. I finally found a promising “second base of operations” - the little town of Oracle, just north of Tucson. In early November (2018) I took a bus to Patagonia, AZ. - an 18-hour trip including the layover in Phoenix - to get on the Arizona Trail. Patagonia was as close to the southern border trailhead as I could get to via bus, and the southbound trailhead was about a 4-mile walk from town. Thus began my second month as my perpetually-traveling-writer alter ego, Poetic Wanderer. Coming from the more challenging CDT in New Mexico, the Arizona Trail seemed more generally well-marked. 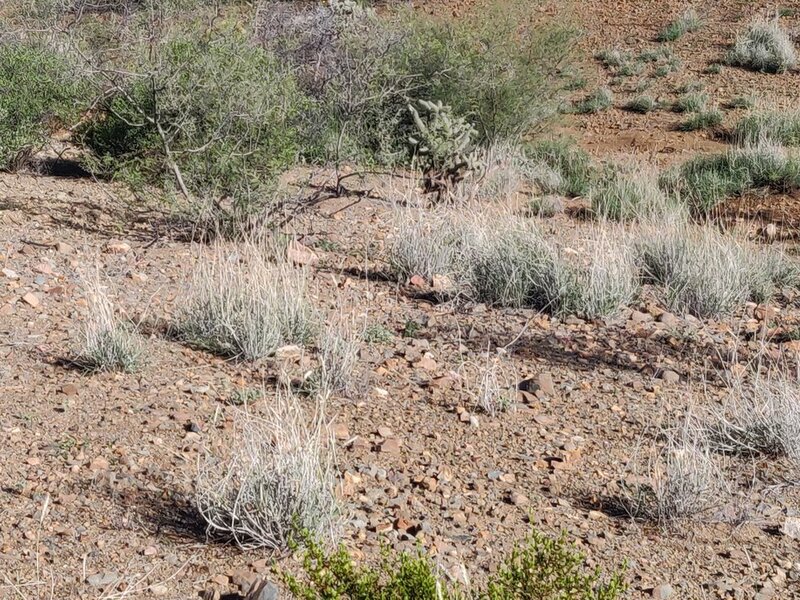 Confusion usually only occurs at the low points, the ravines or arroyos (commonly referred to as “the wash”, which is literally what such areas are, the results of sandy run-off) where you learn to keep an eye out for stone cairns in lieu of signs. Ironically, most of the real drama on this stretch of the trail occurred as I left the trailhead to head back into town. I chose the wrong road - “Harshaw Creek” rather than “Harshaw Road” -, which turned out to be a loop that added six miles to my trek. Or would have. Once I realized the road was unfamiliar and found some signs that confirmed I was off track I faced myself towards Patagonia and stuck my thumb in the air. First time I’d hitch-hiked in years, but I got a ride on my second attempt with a great and gracious guy who was heading to the post office in town, scarcely a block away from the Stage Stop Inn where I was staying. Happy ending. My bus got me into Lordsburg, New Mexico at 2 a.m. I was on the Continental Divide Trail the next morning - so, not quite as rested as I’d hoped to be on my first day out. Lordsburg is located right along the trail, so finding the head was fairly easy. Met some friends early on - many rabbits darting here and there, a horned toad and a chameleon. Oftentimes the ‘trail’ was not discernible. You just scan the horizon for the next sign, and hope to find it. Some of the cow gates were difficult - V-shaped and narrow; wide enough for your body alone, maybe, but not enough to allow a full pack through without being poked by barbs. Everything strapped to the outside of my pack - sleeping bag, bed roll and tent bag - got holes thanks to these gates. As did my puffy jacket. The wind started whipping shortly after that rousing coyote call. It didn’t let up for the remainder of my trek south. My Big Agnes tent got her great test that night, contesting the wind, as I made camp in an arroyo where the tough scrub and low trees cut it a little. I awoke virtually every hour all night. But as it was getting dark at 6 p.m. and not lightening until at least twelve hours later, this still added up to a good night’s sleep in the end. The following day, rain and occasional hail abetted the driving wind. After all my concerns about finding and purifying water out here in the desert, to end up contesting with this instead..! In my frantic haste I got lost a couple times, once ending up on the wrong side of a cattle fence. The extreme weather forced me to cut my trek short a day and reach lodging. I was reminded recently of an imaginative game that I enjoyed when I was a kid. You can manage it in any sort of circular swimming pool so long as the water’s not too high; say, no more than chest height. You create a whirlpool by walking along the outer edge in a single direction for long enough that it creates a current around the perimeter. If you push hard then the momentum eventually becomes strong. I’d get the whirlpool churning as powerfully as I could and then turn at a certain peak moment to go against it, testing whether I could confront its force without being toppled over. I’d imagine I was fighting against dark magic, defying the gods. Then I’d struggle forward in that opposing direction, eventually getting the current to flow the other way. It occurred to me that this is an apt image for what we’re involved in when we begin taking steps to become conscious creators of our lives by working with our own thoughts, feelings and beliefs. Beliefs create momentum. Over time, thoughts that we’ve nurtured over and over again create currents in our lives. We find that we’re constantly being swept in certain directions, even if we don’t much care for those destinations and desperately wish we could land someplace else. Once we become self-aware, though, we can decide to change course. At first, this is bound to create turbulence as we struggle to move against that old momentum. But if we keep at it then the time will come when the currents of our lives begin flowing the other way. All the signs and omens were pointing down a black alley with a precipice at its end. It was as if my life was a river hemmed in on both sides by high granite cliffs and pulled by gravity so that it had no recourse but to plunge over the falls. In time, though, the self-awareness that he reaps from his journey allows him to stem that dangerous pull because he comes to understand the beliefs that gave birth to it in the first place. He turns against the old momentum, feeling its lashes – it affects all aspects of his personal world, up to and including his relationship with his audience – but eventually gets that whirlpool (which is the life-force, directed by us, the creators) moving in a different direction. I used to be addicted to the biographical stories (and the various myths that grew up around them) of the many wounded and gifted artists throughout history. I had the sense that I was staring into some kind of over-sized mirror, which offered me a reflection of a more cinematic self, as I followed their lives. It scarcely bothered me, at the time, that so many of them had died young, or that the time they did spend here on Earth was often filled with suffering. Their otherworldly creations seemed to justify such sacrifices, and it seemed appropriate that their incredible bursts of inspiration could only be sustained for so long. But if creativity is meant to be life affirming, then why should one expect that the creative impulse will inevitably destroy whoever serves as its conduit? And why do the stories of countless burnt out artistic lives seem to confirm that theory? We need our artists to demonstrate how one can live with a creative vision, even thrive because of its presence. Thus far, as history has demonstrated, the arrangement has oftentimes not worked out that way. Is this failure symptomatic of some dysfunction within the artists, some lack of self-love or belief, or rather a consequence of a society that gives them little space to breathe and feel at home? We may also have to consider the possibility that these great creators planned their destinies in just this way all along. Perhaps they never intended to be 'long for the world'. I spun the core of my novel What Casts the Shadow? around a young artist both brilliant and (seemingly) doomed. I wanted to explore the question of whether he could be 'saved'. Could he somehow keep his vision intact and yet still enjoy a balanced and fulfilling earthly life? Could he sidestep the ‘live fast, die young’ credo and cliché of rock'n'roll? I knew that, in order to do so, he would need guidance.That's how his mentor Saul came to be. In the novel Trust in the Unseen, Brandon Chane, the narrator, describes a moment when he touched into his own creative flow in a powerful way. This happens after a tumultuous emotional experience. He forgets, momentarily, all about his own agendas and ideas about what constitutes "real art" and, in that place of free and whimsical play, spontaneously composes what would come to be his favorite song on his band's forthcoming record. Something odd happened to me then, at this critical threshold of my anguish. The world receded; or perhaps my mind relinquished its attachment to its surroundings. Nothing existed except for Rachel and I, for the love that passed between us as simply and undeniably as the breath of skies. The sensation was divorced from all notions of time. This was a single moment that always had been and always would be. My feelings bubbled up from their molten core, lightening and quickening as they rose. They mustered up vibrations in my throat. Sounds demanded expression, so I opened my mouth wide. The notes slowly joined hands and formed a melody. Words sprang out of it like foam from the denser flesh of a wave. I sang without even stopping to consider what I was actually saying. And thus, I serenaded Rachel with what would grow to become the song “Sister/Satyr”. Fortunately, I repeated it enough times to commit it to memory. The creative process is as natural as breathing. That's true for all of us. The question isn't whether we're creative but only in what way. If, for example, you are mid-way through an essay and suddenly feeling stuck - you literally can't squeeze another word on to the page - this doesn't mean that you aren't creative in the moment. Really, you are creating whatever the obstructions are that are getting in your way. Writers, painters, poets, dramatists... all of us can learn how to better step out of our own way. Demystifying the creative process is a big part of that. Putting ART on too-high a pedestal makes it almost impossible for anyone to create it. Such expectations create too much internal pressure for the voices of creation to make themselves heard. More energy is expended in deconstructing than in constructing. ...is much more conducive to making art. The Surrealists had a mission statement that basically read, "You just have to obliterate the ego and give the Unconscious free reign." That was the philosophy behind thousands of binges in various artistic circles. Other creative people turn their back on intoxication but express a similar underlying belief in a different vernacular. "I am a channeler. It's not me doing this writing, but some Higher Power. God, maybe. I'm just the vessel." But our primary work of art is our own lives; and the palette that we use to to paint the canvasses of our lives consists of our own thoughts, feelings and beliefs. Realizing that we're the creators of our own reality can dissolve many of the detrimental theories that we may have about art and what it means to live creatively. We can feel how everything in life is a creative act. It demystifies the creative process, returning it to its natural place as an activity alongside all the others. This belief has makes the whole experience of conscious creation much simpler, more enjoyable, and more powerful - no longer bogged down in dogma and hype. Some of my most spacious experiences of consciousness have occurred in the wake of water dreams, particularly dreams of being underwater and breathing. There is something about the depths of waters that slows the mind to a mystic rhythm where it can feel the essence of things. Thoughts bubble up more slowly, but there is deeper surety to them. The insights can be trusted. They hearken from a place that touches upon endless shores. Water is such an enduring metaphor for creativity. Inspiration "flows" or "dries up". We talk about the stream of consciousness. Consider the life of a beaver, an entire existence centered around relationship to a river. That's some powerful Zen. We lack conscious knowledge of these places, so the picture it gives us… there’s much greater scope and breadth; the watery depths of the psyche know all the variables that are in play, much like dreams themselves do. So many people feel constricted by the walls created by their own conceptions of themselves and of life. The inner psyche in its wisdom knows that what we so often call stability is really a kind of death. The eternal flow of the river shows us the nature of psyche’s essence in movement. The same name sticks to a phenomenon that is never composed of the same waters, the same elements. We can say this as well of the ever-changing psyche. We look at the shape, the contours, and proclaim it a “thing” with definite boundaries and characteristics; we give it this name, though it is never the same from one moment to the next. I’m coming upon the mysticism of the word again, pulled down to the spacious place by the waters of the depths. The mind can be allowed to run like the mystic waters do; not cling to its banks; trust the rock-bed that upholds it, and roll on and on. Clinging is born from a belief that we’re at the mercy of a world that is somehow separate from ourselves. This is the essence of doubt. To come to know the world through knowing our own minds profits us much more. Maybe it’s that the spacious mind – which I have likened to the depths of the waters - feels the essence of events before, or during, their formation; and so it is here that its surety comes from. It knows the forms taken by energy as it molds events in time. It is on this level that predictions can be made, that safety can be felt (even by the ego, if it is willing to listen to these assurances from the dream depths) when the world seems to be in chaos. And maybe tragedy can be more easily borne, too, because on this level we understand the reasons – the inner reasons – for our own participation in it. What benefit could any Entity derive from people mourning over one of its discarded shells? But then, funerals aren't really for the dead but rather for the living. They're part of an attempt to structure a story that's largely incomprehensible to our intellects but perfectly understood by the deeper places in ourselves. The shamanic power of art and music works to push us past the bounds of our preconceptions so that we experience new worlds of consciousness. It urges us to experience life in its most primal and passionate state. Without it we might all find ourselves looking out upon a (seemingly) very sterile and gray world, devoid of magic and wonder. Our minds can grow accustomed to only perceiving and responding to the surface of the living world. Even certain functions of our physical brains work to filter out perceptions and sensations that don’t have anything directly to do with our “biological imperatives”. But because we are possessed of intuition and connections to the deeper aspects of self-hood (such as dreams), our race has always been aware of other “realms” or dimensions of existence. We give these magical, dream-like faces of reality various names: the occult, the supernatural, the unconscious, the fairy realm, etc. "Shamanism" is a word that has been given to various traditions throughout the world that aim to access and explore these worlds. One of humanity’s touchstones to these other dimensions has always been music and the other arts. Like dreams, our artistic creations can function as bridges that we can pass over in order to explore altered states of consciousness and non-ordinary perceptions. In ancient times, music played a crucial role in shamanism. Shamans would journey beyond the confines of the known world in search of wisdom and insights that could benefit their tribes. Drums, rattles, flutes and even stringed instruments were utilized to send them on their way. Obviously, many people can learn to play musical instruments. It requires a more unusual individual - someone with the particular disposition - to function as a shaman within the context of modern art. “This thing that you have,” she said, “this spark, fire – the unknown variable that a dozen different writers have given a dozen different names to – it’s really rare. I mean, so many aspects have to somehow magically come together in order for it to work. Some people are really verbose and yet they don’t have access to those depths, or they’re afraid to go there. Others have the emotional or spiritual openness and yet they can’t articulate it. I think it’s so fitting that your band is Edge of the Known, because you really have found this edge where you stand and you’re in touch with all of it at once, transmitting it… God, I don’t really know how to explain any of this! Modern science has drawn parallels between these kinds of rhythms and the human brain's alpha state, which is associated with dreams, non-linear thought, intuition and artistic expression. The alpha state of mind draws connections between thoughts, impressions and concepts in a different way than the logical faculties do. It is more associative and feeling-oriented. This kind of consciousness is responsible for the inexplicable quality within certain works of art and/or music that move us in ways that we find very hard to describe. The precepts of shamanism continue to assert themselves in the modern world through such forms of expression. The human soul always seeks to express as much of what it is as it possibly can in physical terms. Our culture has, unfortunately, curtailed much of this expression with its heavy emphasis on logical thinking and an assembly-line approach to living and solving problems. The kind of psychic one-sidedness that results from this unbalanced emphasis can generate counter-reactions on the "other end". This can be seen in the New Age modes of thought that stress other aspects of the mind (like intuition and extrasensory perception), less healthy ventures such as alcohol and drug addiction, and the modern revival of interest in shamanism. Music and the arts, if created and responded to with reverence and respect, can serve as a kind of therapy for us in this lopsided cultural climate. They can remind us of those other dimensions that we've always been aware of but have oftentimes not been able to perceive because of the narrow state of consciousness that we've hypnotized ourselves into. The Edge of the Known series is on one level a prolonged meditation on the pursuit of immortality through art: In this case, music. Any work of art exists in dimensions beyond the ones that our physical senses perceive, so it's maybe inevitable that many artists ache to "overreach" their own lifetimes through their work. Like anything else, it's a quest that can be pursued in either pride or humility; put to the service of a person's ego gratification or to "the greater good". It's not possible (at least not at this stage of our evolution as a race) to edit, re-record or airbrush events from our own physical pasts; but a work of art affords us the chance to do this, to "get it right"; to pursue perfection. Or is this notion an illusion? There is a conversation early on in What Casts the Shadow? that sets the tone for my own fictional depiction of this quest. This occurs between the two founding members of Edge of the Known: Bassist and singer Tommy Visconti and Brandon Chane, singer/guitarist and narrator of the story. This brief exchange cuts to the heart of the differing philosophies and sensibilities at work within the band at that time. Tommy dreams of a long and personally-fulfilled life. Brandon longs for immortality through his art, even if it comes at the cost of longevity and normal human happiness. Wrapped up within this aspiration towards immortality through art lies a hidden despair, however, because Brandon doesn't really believe that he can have a fulfilled life. He's given up on the notion of finding satisfaction in "this world", so he seeks it "Beyond". This is his motivation, at least initially, for seeking to translate his ephemeral experience into songs that will "live forever". Different artists will have different reasons for embarking upon such a quest. Some want to prove their detractors "wrong". Some want to justify their existence through their art. Some conceive of it as an act of compassion, a healing gift for the generations to come; and Brandon shares this ideal, too, as he conceives of the healing power that his music will (hopefully) wield over his audience as a kind of compensation for the harm that he's caused the people within his own personal orbit. A precept of many forms of medicine and therapy that predate our own maintains that prospective healers - shamans, medicine men - must suffer through and transcend their own wounds before they can exercise their new-found healing powers. Their ability to diagnose and combat illness in others is derived from their intimate encounter with the reality of illness, and its true underlying sources, within themselves. Because of this, spiritual and/or physical trauma would often serve as a precursor to someone adopting the shaman's vocation. Oftentimes there would be two such internal crises: one occurring in childhood and another in adolescence. The wound obliges would-be healers to connect with the unseen world in order to regain spiritual equilibrium. Again there is the sense of something missing from the known paradigm within which the healer exists, the need to seek for a broader conception of reality and definition of Self. This period of suffering and searching constituted a form of initiation, a process through which shamans and medicine men broadened their perceptions to encompass a deeper and wider view of reality, of the full depths of both sorrow and joy in human life. Any journey involves things unknown and unseen. None of us would step outside the ‘safe arms’ of the status quo unless we felt that something was lacking there; that there was something more expansive and fulfilling still to be found. This search invariably involves pain, privation and other forms of suffering. But these emotional straits are oftentimes what prompts the potential healer to grow and expand in his or her view of the nature of things. Fear, for example, can be used as a springboard into new life. Feeling fear and moving forward in spite of it can change our very conception of ourselves. Artistic pursuits, spiritual seeking, psychological explorations... these sorts of endeavors are usually born out of a state of existential unrest. It's instinctive: The presence of pain makes one immediately search for possible ways to soothe and/or end it. It brings things back to the age-old question of suffering, of being wounded. Is it necessary for art, for self-awareness, for 'enlightenment'? It's not so much a matter of suffering being inherently connected with growth and consciousness raising, per se, but rather that we human beings just need some kind of motivation in our lives. The wound, then, can serve as the impetus for seeking answers to hitherto-unasked questions; for finding an artistic response to the problems of existence when none of the world's tried-and-tested roads will serve; for learning to listen to your own inner voice when the words of others fail to soothe or clarify one's underlying unease. I'm generalizing a little for the sake of illustration, but basically, people who feel satisfied in their lives, happy, like the world provides for their needs and holds its own meaning, aren't typically going to feel called to pursue the deeper questions of life. Shamans and medicine men often served as the healers within a tribal context. They could be considered the first physicians. Their particular therapies often addressed the spiritual and emotional condition of their patients rather than the physical body, but this did not mean that physical healing did not occur. Indeed, mind-spirit-body was usually perceived as one whole and complementary system. The condition of the body was thus seen as a reflection of inner reality. The arbitrary separation that is such a fixture of Western medicine didn't apply within these ancient therapeutic models. In the third installment of The Edge of the Known trilogy, Humanity's Way Forward, narrator Brandon Chane and his bandmates receive a write-up in an alternative magazine that likens their music to the healing arts of shamans from antiquity. The members of this band have been surprisingly candid about their own difficult pasts in their various interviews; and it’s not hard to see, amidst the accounts of drug addiction, isolation, physical and emotional abuse, etc., the arc of ‘trauma followed by artistic release and a return to wholeness’ that is so prominent in the archetypal story of the shaman. It’s particularly evident in the struggles of guitarist/singer Brandon Chane. The echoes of those scars can clearly be heard in Edge of the Known’s music. But one can also discern, quite distinctly, that other inexplicable thing that is within all of us, the undying flame that transcends our wounds and sufferings, that connects us to one another despite all that we’ve struggled and suffered through. If this isn’t shamanic art then I don’t know what is. The title of the second Edge of the Known novel, Trust in the Unseen , was inspired by a blog post that I wrote a couple of years ago, which in turn was inspired by a dream. A lot of commotion had been stirred up in a small logging town (nobody said so, but I somehow knew it was Aberdeen, Washington). It seems that a package had arrived, containing some kind of priceless treasure, and no one knew where it’d come from. The media descended upon this small town trying to get to the bottom of the mystery. When I woke up, I immediately associated Aberdeen with Nirvana, and I noticed the parallel at once. Here was a band that had emerged seemingly from out of nowhere to turn the musical world on its head. And Kurt Cobain’s ability to connect with his audience through his words and music was a ‘treasure beyond price’. So, the dream was reminding me that the fulfillment of any dream is really a magical event, something that can’t be reduced to a series of logical steps. Like ourselves, it has its unseen source. That media crew will never be able to trace the origins of the precious delivery because it sprang from the magic of consciousness itself. The reporters in the dream can be seen as the way our minds tend to race about looking for ‘explanations’ in the face of the unfathomable. We’re not taught to see ourselves as the creators of our reality. Everyone learns, pretty early on, that the way to make life work is to get out there and manipulate things in the world, one way or another. What else can you do, in a (supposedly) mechanical universe without soul or significance? And yet, logic-brain will always be confronted by certain phenomena – like the sudden appearance of priceless treasure in a poor logging town, or the emergence of the world’s biggest band from out of nowhere – that it just can’t explain from that framework. This includes events that seem impossible from the perspective of the reasoning mind. All of this ties in closely with the philosophy of Saul Mason, Brandon’s mentor, who insists time and again that our joys and victories, as well as our disasters and sorrows, all originate from within us. This is the essence of the magic that the greater part of humanity has learned not to believe in. Trusting the unseen source involves opening our minds to the possibility of that magic, letting it touch us – and realizing that, oftentimes, the way in which it works really can’t be explained. But it can be relied upon, nonetheless.